SendGrid is one of the largest transactional email sending services and delivers emails for companies like Spotify and Uber. It offers a number of different APIs and supported client libraries. In addition to sending standard transactional emails over its API, SendGrid also offers a marketing platform with a drag-and-drop email template editor and online list management. 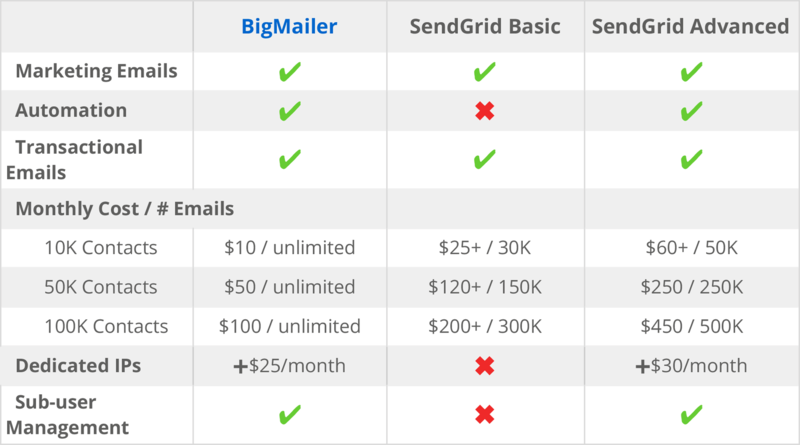 So why should you consider switching from SendGrid to BigMailer (or other email service providers)? Read on. The transactional and marketing (bulk) emails at Sendgrid are priced completely separately – you pay for number of contacts stored for marketing emails and separately for the number of transactional emails sent. In other words, there is no financial advantage of consolidating your emails in a single platform like SendGrid, especially since there is no support for automated (drip) campaigns. The subscriber list and more importantly bounce rate data in SendGrid isn’t synced up between the 2 systems that help you manage transactional and marketing emails. If you already use SendGrid for your transactional email and want to send marketing emails you need to manually import the list of customers into SendGrid marketing system and manually filter bounces from that list by exporting your bounce list from the transactional emails system first then importing it into marketing side. Seems like an unnecessary painful separation. While the marketing and transactional systems have separate separate subscriber record management this separation doesn’t apply to all account data and settings. There is only one place to define link tracking so the values are global and used on both marketing and transactional emails, including campaign level utm_campaign for Google Analytics (which shouldn’t be set on account level, but rather on campaign level). Lastly, link tracking is disabled by default so you need to actually turn it on to start sending your email engagement data to Google Analytics. 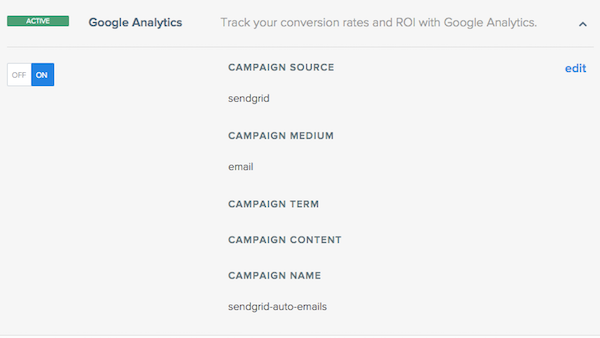 SendGrid Tracking Settings – global and used for both marketing and transactional emails. Is it time to consolidate all email types in a single platform with simple flat pricing? We certainly think so. Not convinced? Check out the price and basic benefit comparison below.